DRY ROASTED CRUNCHY FLAVOR. Not too salty, these naturally gluten-free, GMO-free dry roasted pumpkin seeds contain all the essential amino acids, making it a complete protein source. Our allergy friendly pumpkin seeds are a delicious smart snack and can also be scattered over salads, granola, mixed with applesauce or yogurt or added to most baked goods. Helps insomnia, the prostate and lowers cholesterol. Extremely popular and often order ed in Bulk for more savings. 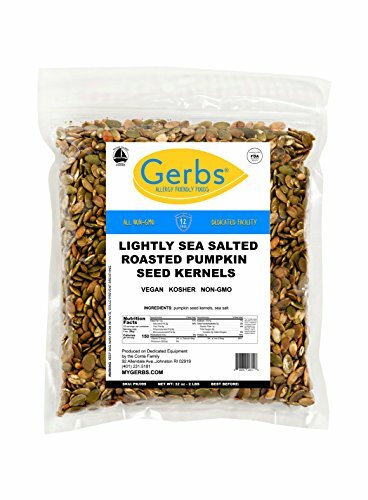 Gerbs Dry Roasted Light Sea Salt Pumpkin Seed Kernels, country of Origin - Mexico. Produced on 100% Dedicated Roasting and Packaging Equipment. This deal includes 2 Pounds of Lightly Sea Salted Pumpkin Seeds, packaged in premium a re-sealable zipper high barrier food grade poly bag yielding an All-Natural shelf life of 1 year without using any chemicals or preservatives. This product is Allergen Free and tested by the CSA, 100% All-Natural/NON-GMO, Vegan, and Kosher. Simply, there are no other Pumpkin Seeds on the market as fresh as Gerbs, which taste like homemade seeds, while also being Allergen Free & Non-GMO. Order some day, we typically ship within 24-48 hours, and then taste what you have been missing!